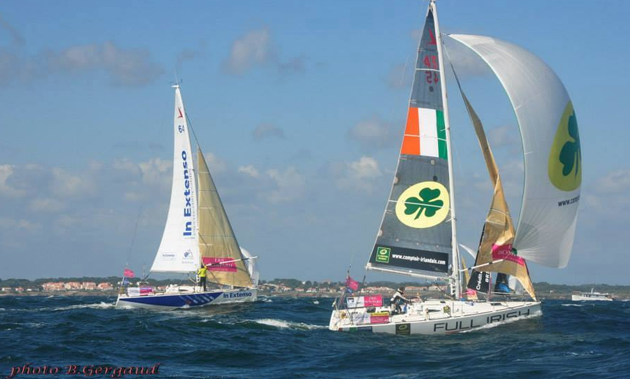 The start of leg 4 from Les Sables yesterday (Sun) was pretty wild. 25 knots and a two metre swell in bright sunshine made for a fine spectacle. The 2.5 mile windward leeward start of the long 490 mile leg to Cherbourg sorted a lot of things out quite quickly with fairly large variations in speed shown straight away. Spectacular surfs downwind eased the pain of the long upwind slog along the rocky coast and as night fell the fleet was heading West towards the approaching depression. David made a good start and held his own around the course and this morning was in the top half of the fleet in much lighter airs sailing North past Belle Isle. Having sailed most of the night upwind into a dropping wind as they crossed the pre-depression ridge the fleet is now reaching with spinnakers heading North West to the Chausée de Sein, the next mark of the course. But as ever there is a trade-off going on between being further west and getting the better breeze earlier or further north and getting to the mark earlier. Later today (Mon) will show us which side of the fleet has got this right. At 08:00 this morning David was in 10th position on the Eastern side of the fleet.